Include this poem with a teddy bear and a jar of Hershey's Kisses HUGS. He'll give a tiny hug. 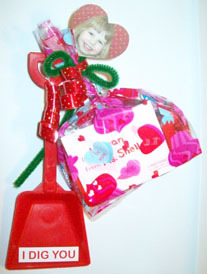 and tied with curling ribbon to a little red shovel that says, "I Dig You!" To make valentine delivery quick and easy, try using peel-and-stick labels (available at office supply stores). valentine box. On Valentine's Day, each child simply matches the labels for easy delivery. card say to the stamp? A. Stick with me and we'll go places. the girl octopus on Valentines Day? hand, hand, hand, hand, hand, hand.